Joy Ultimate Lamb Meal and Rice Formula Premium Dog Food is crafted using only the finest ingredients. We start with nutrient-rich foods to ensure your dog has the health and well-being they deserve. We use no animal by-products,wheat,corn, or soy in our recipe. Natural sources of Omega 3 & 6 from chicken, fish, and vegetable sources play a crucial role in a strong and healthy immune system. These Fatty Acids help maintain a beautiful, shiny coat. We have also formulated this wholesome blend of ingredients to provide sources of Glucosamine & Chordronitrine that support healthy joints. This is the Ultimate dog food. 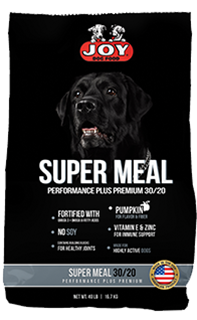 Joy Lamb Meal and Rice Dog Food is formulated to meet the nutritional levels established by the AAFCO dog food nutrient profiles for adult maintenance.